Most gnomes are either caring for birds or doing some gardening work; but this gnome is having none of that. A long requested garden ornament, our new larger middle finger gnome makes the perfect gag gift when you just can�t find the right words to say I love you. Simple and classy with his Go Away Sign, this rude garden gnome giving the finger is a real hoot. Made of poly-resin, our middle finger garden gnome is good for both indoor and outdoor display. Size: 7.5"L x 7.5"W x 18"H, Approx. 4 lbs. 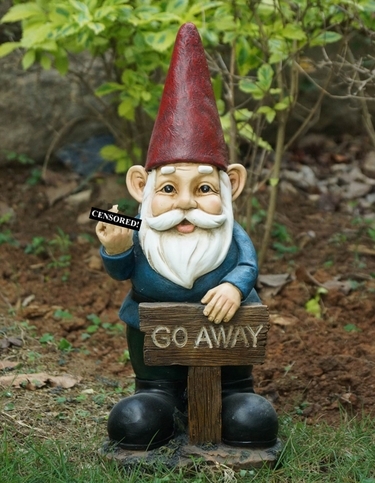 Warning: Although this rude garden gnome has been made with whimsical intent and good fun, please realize that not all people share the same sense of humor, and could find him offensive. Please use discretion when sending this middle finger garden gnome as a gift.